Must come see this place. I went to a couple other dealers and wasn't treated half as good as I was when I came to CARZ Auto Sales, Nick and Steve were great. They treated me with respect and honesty everything was explained to me in detail I felt very comfortable here. If you're looking for a pre-owned car I truly recommend CARZ Auto Sales. Great experience, staff very friendly and professional especially Sam. Mike and Pete are awesome, all around great experience I would definitely recommend this dealership to others looking for a nice vehicle. Beautiful service and excellent staff!!! Steve and Sylvia were my matchmakers and they did a great job. Went in with little to no expectations and drove off with a comfortable monthly payment and my new baby! 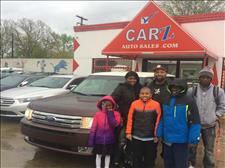 Customers Satisfied with Their New Family Vehicle.! 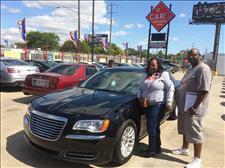 CarZ Auto Sales We Know how to make our customers Happy!!! Another Happy ans Satisfied Customer!!! 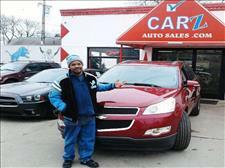 Choose CarZ Auto Sales.!!!!!!!! We Know How To Keep Our Customers Satisfied !!!!! 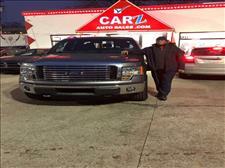 Another Satisfied Customer Here at CarZ Auto Sales!!! Great place to come to for a great car. They have they own bright personality and make you feel comforting while helping you choose which one you want. They very reasonable with they prices and loyal to they service. .I bought a My Cadillac here with the extend 2 year warranty! Not only was the car in perfect condition, all my services were taken care of my the dealership! I Am now a loyal customer! Great place. Great people. Went above and beyond to help me get into a dependable vehicle before the winter. Definitely recommended. At Carz Auto Sales we are proud of the quality used cars we sell and our dedication to serve the needs of our customers. This is reflected in the amount of repeat business we receive. Whether this is your first purchase with us or one of many that you’ve had, you can count on our dedicated sales staff to make it the best buying experience possible.